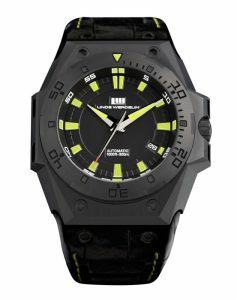 Linde Werdelin, leading sports and attachable instrument watch brand, launches the second limited series of the Hard Black DLC to add to its niche array of elegant sports watches. Following the success of the first series, the Hard Black DLC II is based on the new model The One with new hand and bezel details, which add to the unique allure of Linde Werdelin watches. 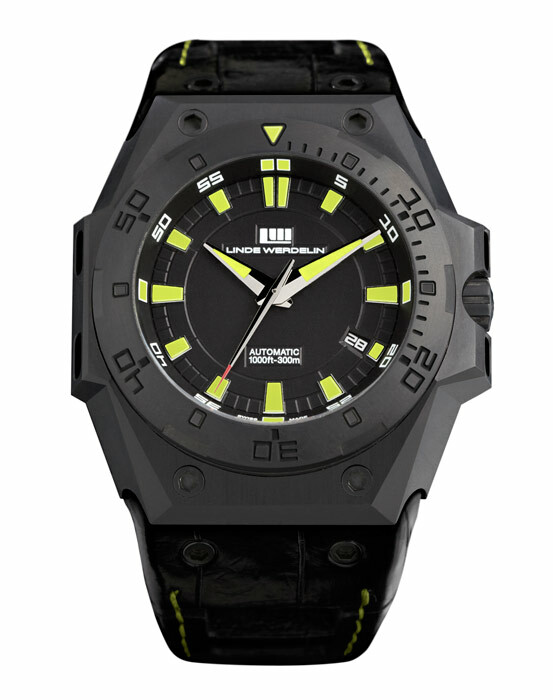 The new Hard Black series features a colour contrast of bright yellow luminous hour markers, strap stitching and the all black of the case while it shares the same case dimensions with the rest of the LW watches to ensure the safe attachment of both the Rock and the Reef. The steel case initially goes through a hardening process and for this series, the Hard Black II is microbille finished before the DLC coating is applied. This new procedure, ensures an even tougher case coating. The case then is blasted with around one thousandth of a millimetre of carbon to create a surface up to three times harder than steel and second only to diamond in hardness. This hydrogen free diamond structure crafts the watch in such a way that it guarantees extreme durability and virtual scratch and corrosion resistance, perfect for any sporting environment. “All Linde Werdelin watches are often rigorously put through their pace in extreme sporting environments, the DLC coating compliments and reflects the rugged yet architectural nature of the watches. As the most sophisticated natural materials have all been discovered, as designers, we must push technology to develop new improved materials and new ways to strengthen the existing materials available” comments the Creative Director and co-founder of the brand Morten Linde. Linde Werdelin’s Hard Black has already endured the harsh conditions on Leo Houlding’s series of latest expeditions in Europe and the US. The British rock climbing and Base Jumping prodigy has been wearing the Hard Black Elemental when simul climbing the remote mount Riglos in Spain and Yosemite in the US. The Hard Black II series is limited to 88 pieces and is currently available to pre-order on Lindewerdelin.com or from any LW authorised retailer.